LuFisto kicked off 2014 the same way she continued and finished it: by absolutely killing it every time she set foot in the ring. February saw her defeat Athena in a thrilling match for the number one contendership to the WSU World Championship, then a few months later defeat her again in a 2 Out of 3 Falls match for the vacant title itself, in what many people (including myself) described at the time as probably the two best matches in WSU’s history. Her first major world title outside of her native Canada, it’s the culmination of over a decade of diligence and sacrifice, and despite her ongoing feud with WSU owner DJ Hyde and his goons, it doesn’t look like there are any signs of her reign coming to an end soon. It could so easily have been double the elation for Lufi, as in April she took on SHIMMER Champion Cheerleader Melissa in yet another 2 Out of 3 Falls match, missing out on the title only by a whisper thanks to a referee bump and interference by Mercedes Martinez. Nevertheless, she continues to be a SHIMMER mainstay, putting on some of the promotion’s best matches every time she’s there. 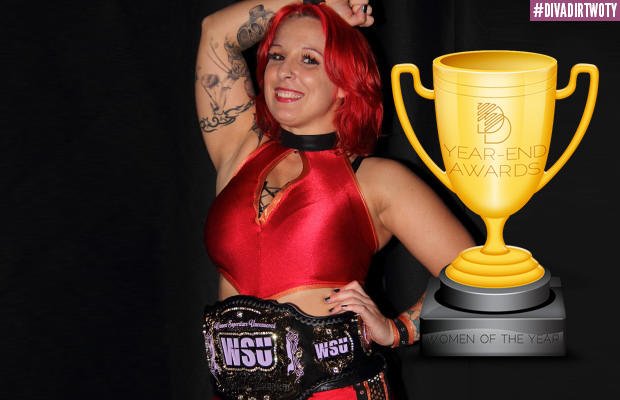 It seems that LuFisto is now finding herself in the prime of her career, despite thoughts in the past about hanging up her boots. As she enters 2015 as a World Champion and with main-event status in virtually every promotion she’s in, it looks like the decision to keep soldiering certainly paid off. With the momentum she’s built in 2014, could we perhaps see the SHIMMER Title finally make its way around her waist next year?